CPU and motherboard are watercooled. The card we got test has VID of 0.95 Volt. Remember, that Fermi architecture cards have individual vaoltage values for full load operation mode. The GPU itself contains voltage value required for its correct operation, while BIOS only specifies the limits. 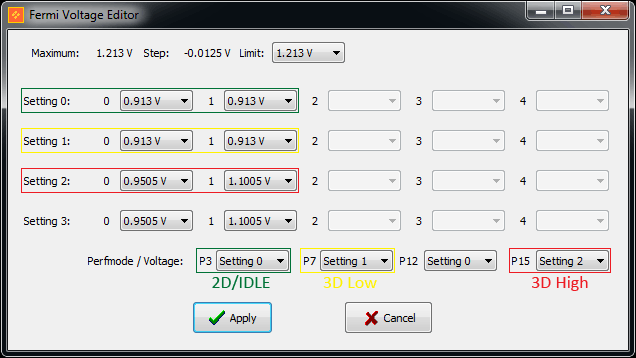 This means that for each card the voltage value in 3D High mode lies between 0.950V and 1.1V. When you connect two monitors to the card, the card set 3D Low settings instead of ones for 2D/IDLE mode.